Is there a better alternative to FRS Division Drills X? 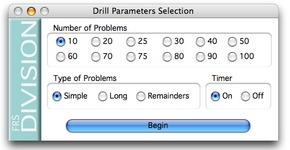 Is FRS Division Drills X really the best app in Mathematics category? Will FRS Division Drills X work good on macOS 10.13.4? FRS Division Drills targets mental and long division skills. "Simple" practice allows students to practice and develop their skills in solving division problems in their head (or with scratch paper). "Long Division" practice aides in helping students learning the steps involved with completing more complex problems including division with remainders. FRS Division Drills X needs a rating. Be the first to rate this app and get the discussion started!